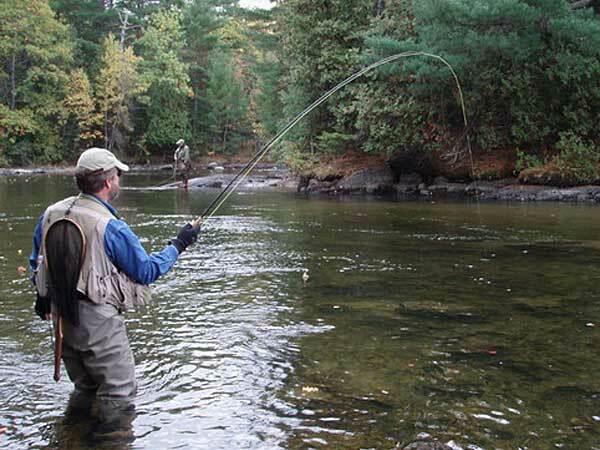 A major factor in fishing in streams and rivers is wading safety . Many anglers enjoy getting into the fishes habitat to maneuver throughout the water to catch fish and fill your stringer. Yet many do not know essential wading safety tips that may one day save you or friends from injury. First and foremost, equip yourself with a safe and dry pair of waders. Whether they are hip or chest, make sure they are snug on your foot so your feet do not slide and cause you to lose your balance. Secondly, when entering the water, examine what is in your surroundings. This proves to be very helpful because if you lose your balance there may be something to grab on to and stabilize yourself. Always be aware of the water depth, especially when wading in hip boots. Hip boots are more susceptible to having water in them because of their length, and will be very dangerous if fill with water. Most importantly, if you happen to fall in and have water start filling your waders, always remember to immediately bend your legs at the knee. Do you ask why? This action will trap what air is left in your boots to act as a floatation device and it may just save your life. Once bending at the knee, the air in your boots should keep your lower half afloat. Then lie on your back with your face out of the water and swim to the nearest shore.